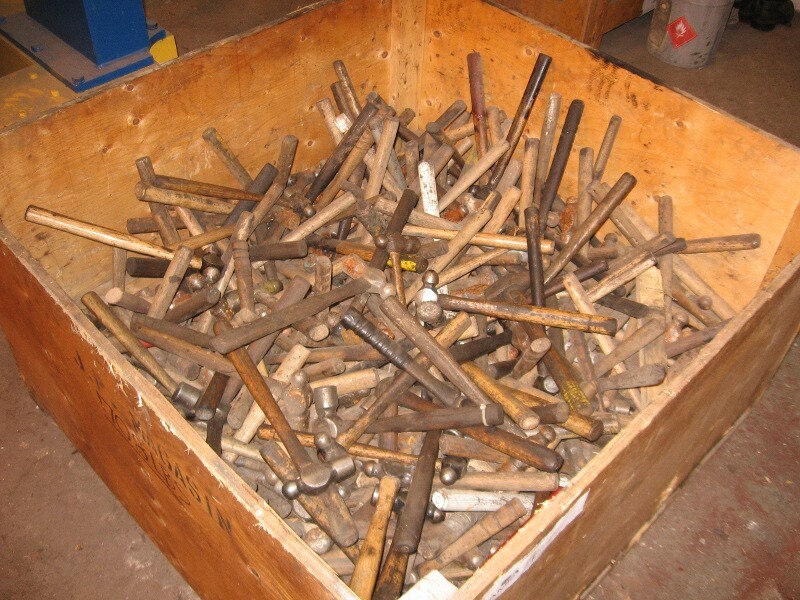 State-of-the-art collaborative tools are about as useful as a box of hammers (see photo) if no one is clear on the aim of the project. It is misguided to think that your team has a good collaborative environment just because everyone shares the same database, or that a specific social media tool is all you need to get a project humming along. This big, 4-foot box of well-used hammers is evidence that some work got done. *Yes, the expression is “bag of hammers.” Still, hundreds of hammers are as useless as one when there is nothing to strike and no one to do the work. Photo courtesy of Ev Larsen. Know the objective before defining the tools. When you start any collaboration, and before you look at collaborative tools, first answer one question: What are the goals of this collaboration? Everyone involved might have a different answer. You might not even be able to ask everyone. Unless you do focus or panel testing, the final customer might never voice her expectations until the document is published. The need to convey certain information is only the tip of the iceberg when it comes to objectives for a document. Readers have different expectations from sales managers who differ from engineers and lawyers. Expectations also lead to assumptions about the kind of project it will be. Looking at the project this way helps determine what the document must do. You may have to make some preliminary decisions about scope and style, but try to stay open as long as possible to other ideas. Certainly, how you answer these questions about the aims of the project begins the team-building process and sets you up for success. Remember, anyone not yet involved might have expectations that need to be captured, too, whether they are providing information, reviewing information, or approving text and expenses for production. Even when you have a strong idea about what is expected, you must continue asking questions. Where is the source information for the document located? Who is involved in the project and where are they located? Do you have all the information needed? Are there subject matter experts to consult or is some research required? What kind of consultation will be going on among those involved and how can the process be supported. What steps will the document go through before it is complete? Tools facilitate access to, and handling of, information. To make collaboration work, you need skilled people, tools, and authoritative information all in the right mix. Collaborative writing may not be the best way to get every job done in a business context, even for large documents. Once you decide what the aims are, the collaborators can plan how to achieve them and what tools will work best. ← PreviousIs your organization losing its mind? Christine Hastie specializes in coaching writers, collaborators, and teams to success. Working in creative, technical, and therapeutic fields, she guides people to find their true message, especially when producing written resources that advance knowledge and help others.